I don’t recall how it all started, looking back now, some fifty-odd years later I can’t even identify at what age my interest began. All I remember is that by the time I was 10 years old I was mad about them; I knew every combination of fleet number, registration number, body style and colour variation. I could identify the prefix registration letters from a mile away just by slight differences in body styles, and by the time I went to secondary school I was acknowledged by my peers as an authority on the subject. Now what am I babbling on about, well Western Welsh single decker buses of course! 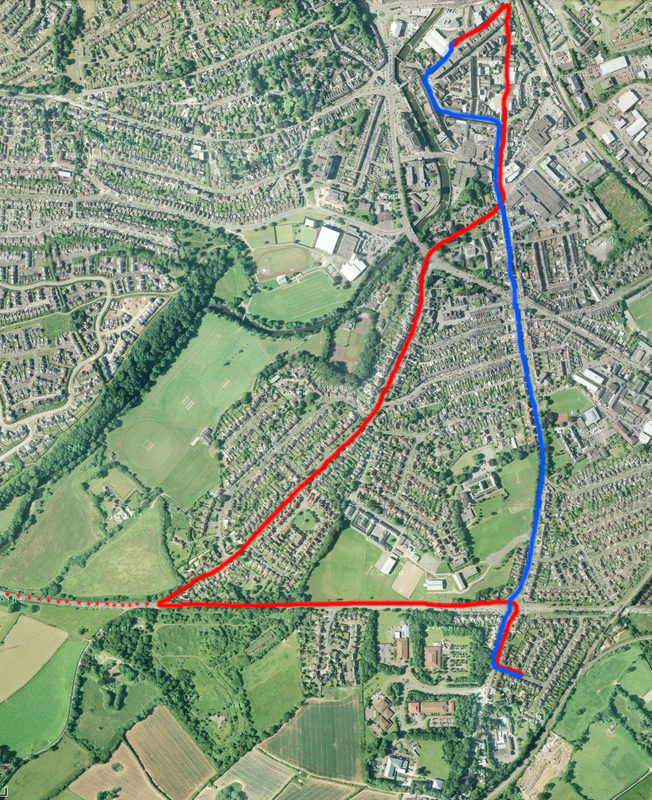 One of the routes operated by the company was a short local round trip to Priory Avenue, the outward journey via Merthyr Mawr Road (in red on map), the return journey via Ewenny Road (in blue). 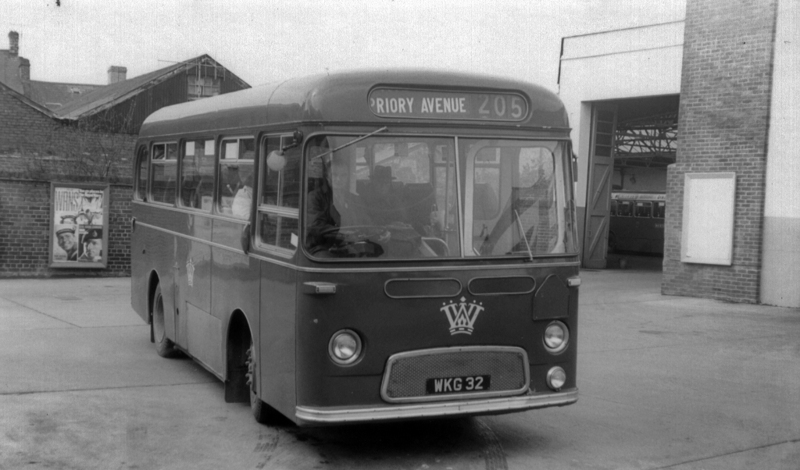 Always, one of the older half-cab post-war buses of the DKG 9xx series would operate this route but one day a brand-new smaller bus was seen turning in Priory Avenue. The first new bus to operate on this route was TUH 2, an Albion Nimbus with a 30 seat Harrington body and looked gorgeous in its livery of red with a cream waist band and cream roof. With six rows of seats either side of a central aisle and a row of five at the back, there was also a single seat facing inwards at the front of the bus, perched on top of the wheel arch, and this was to become my favourite position from where I could easily watch the driver and also an uninterrupted view of the road ahead. TUH 2 was later replaced by a Nimbus from the WKG series; they were the same but with a Weymann body built to the same specifications as the Harrington, so they looked identical. I was so taken with the Albion Nimbus that it started off a new craze, destination boards on my bike! I was always quite creative and on a piece of white card I drew the front of the bus, with little interchangeable destination boards and registration numbers, which I then attached to the front handle bars of my Dawes bicycle. Very soon some of the other kids wanted one as well so I had a little production line going, although they had to provide the card. With a cardboard cigarette-box “engine” flapping against the spokes of the rear wheel, courtesy of one of the local boys whose Dad was a “Players” rep, we roared around the local streets pretending to be one or other of Western Welsh’s fleet. A chance conversation about ten years ago pointed me in the direction of a former employee of the bus company who knew someone who had a lot of Western Welsh photos – about 200 of them, all from the 1950s and 1960s. In no time at all I had sought permission to copy the entire collection and dreamily wallowed in nostalgia recalling those far-off days of my childhood when happiness was a bus I hadn’t seen before. Good stuff! Have you ever been to Malta where all good ex UK buses used to end their working days? Afraid not Andrew, not a great traveller, been to very few places outside GB really! have a look at the Swansea Bus Museum website and also the Cardiff Bus Museum site at the old Western Welsh garage in Barry. Well worth a visit. Also if you are interested in trains take a look at the Garw Valley Railway web site. Thanks Colin, I’m aware of all the places you’ve mentioned, not yet visited Swansea museum but next open or running day I plan to be there.